Once a year like clockwork. Happy birthday to doctorwho42, barbedwriting, and savageseraph, and happy early birthday to metal_aria! May all of you enjoy many happy returns of the day! And THANK YOU to all of you, my friends, who have wished me a happy birthday today! :D You're the best, and I'm grateful for each of you. I'll leave you with Virginia on her walk. omg, how cute is *that*?! She's got her own afghan. How cold is it there now??? Aw, thanks! :) My mother makes her afghan sweaters, and she loves them! We're in Oklahoma now, but I think back home in North Carolina it's in the low 50s (high). At night it's below freezing. I always forget what a beautiful place you live in! I hope it's a wonderful day! Ha, thanks! :) Virginia loves that coat, too. Once it's on, she doesn't want to take it off. This is yet another favorite my mother made for her "granddog." Granny squares for the win, indeed! Eek! Happy Birthday! I'm not too late, am I? Thanks so much! *hugs* You're right on time! What a lovely area of a walk! And, of course, Virginia looks as dashingly chic as ever. And, of course, Virginia looks as dashingly chic as ever. Aw, thank you! 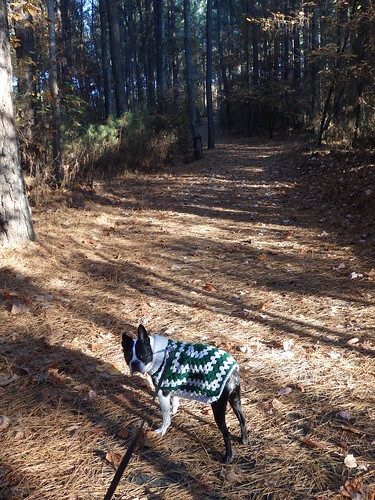 :) She walks with a special strut when she wears her sweater in the autumn/winter. Happy Birthday! That looks like a lovely walk to take on a beautiful day! Thanks so much! :) We love a good walk in the autumn. Awwww, Virginia's sweater is adorable! Aw, thanks! My mother made that for her "granddog." :) Once we put it on Virginia, she doesn't want it taken off again. She loves it!